If you love peanut butter like I do, I have THE snack/breakfast/dessert recipe for you today. I named this “extreme peanut butter granola” because it’s so peanut buttery (in a good way!) thanks to the peanut butter in the granola, plus the salted peanut mix-ins. This peanut butter granola tastes almost just like eating a peanut butter oatmeal cookie, and the ingredient list is short and sweet with just oats, peanut butter, honey, salt, a pinch of cinnamon, and salted peanuts. Just the peanut butter and peanuts alone are perfect in this granola. But I think you can never go wrong adding peanut butter chips, mini peanut butter cups, dark or semisweet chocolate chips, or even coconut flakes (one of my favorite granola mix-ins). 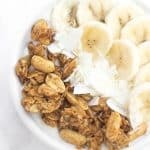 If you don’t love peanut butter, I recommend making my favorite kitchen sink granola recipe instead. But if you’re like me and LOVE peanut butter (as in, I had peanut butter oatmeal for breakfast, a peanut butter chocolate chip Larabar for an afternoon snack, and a couple of handfuls of this granola after dinner), this is the recipe for you. This peanut butter granola was a hit with my whole family and we’ve been snacking on it constantly for the past few days. I made two test batches to get the taste/consistency/clusters just right, and both batches are already almost gone. 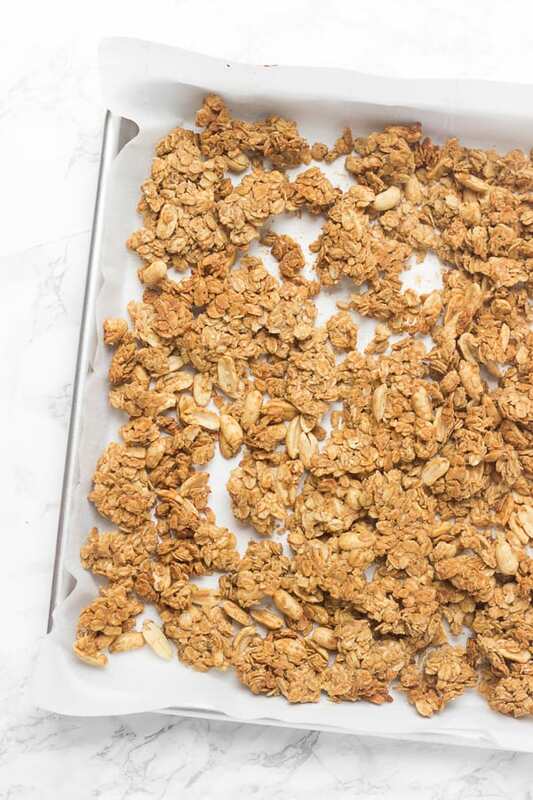 When it comes out of the oven, this granola is in one giant cluster, so you can break it up into clusters as big or small as you’d like. 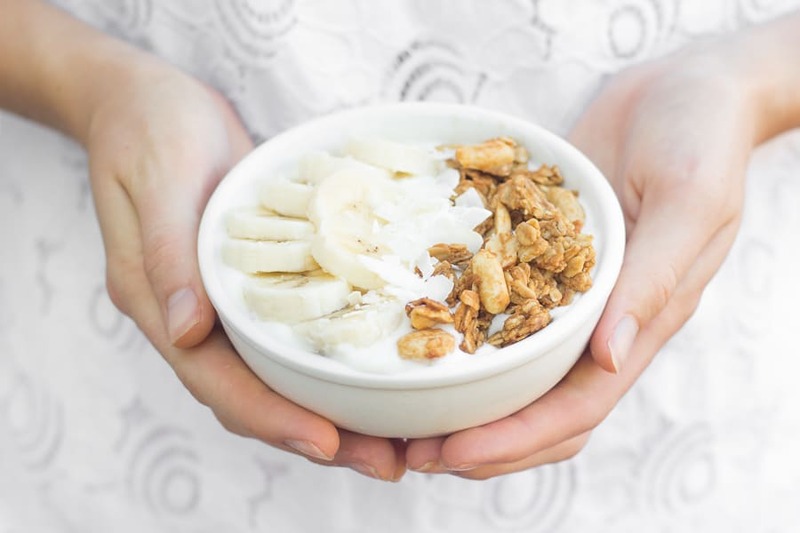 It’s delicious over yogurt, and the peanut butter granola + banana + yogurt combo is pretty irresistible, although my favorite way to enjoy granola is by the handful. I freeze my granola to maintain its utmost freshness, and frozen granola tastes even better to me. Any way you make this…you’re gonna love it. If you try out this peanut butter granola, feel free to let me know in a comment or take a picture and tag me @livbane on Instagram. Hope you enjoy! Chocolate chips, coconut flakes, mini peanut butter cups, peanut butter chips, etc. In a small or medium mixing bowl, stir together oats, cinnamon, and salt. In a small, microwave safe-bowl or measuring cup, heat honey and peanut butter together in microwave for about 20 seconds, or until softened. Pour peanut butter and honey mixture over oats, add peanuts, and stir to combine. Line a baking sheet with parchment paper and spread oat mixture out in a single layer. Press oats together firmly with a spoon or spatula (this will help it stick together in clusters). Bake at 325 for 20-23 minutes, using a spoon or spatula to flip pieces halfway through (don't intentionally break up the clusters). Bake until granola is starting to lightly brown. 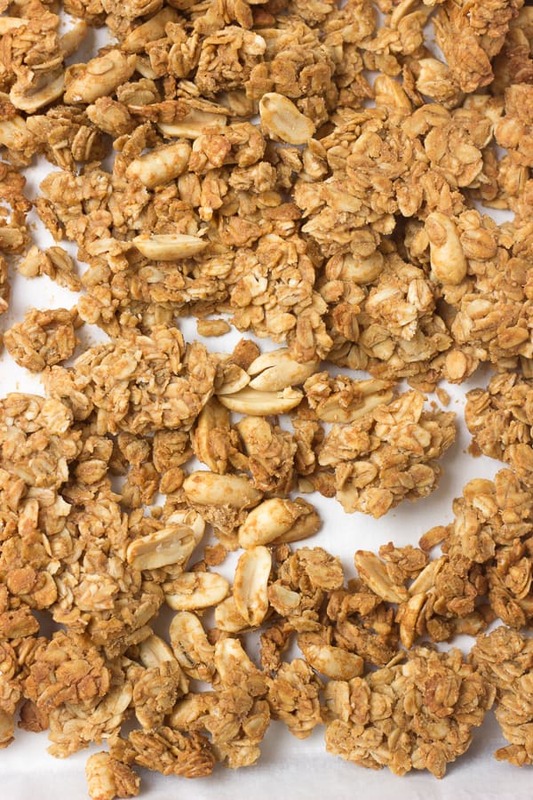 Remove baking sheet from oven and press granola down and together (to help form clusters), then leave it to cool. Once cooled, add any additional mix-ins like chocolate chips, coconut flakes, mini peanut butter cups, or peanut butter chips Break into large clusters and enjoy! For optimal freshness, store in a ziploc bag or air-tight container for up to 5 days, or freeze for up to several months. I love how easy this recipe is! I already have all the ingredients, thanks for sharing! Awesome! I always keep peanut butter, oats, and honey on hand, too…and probably use most of these every day! 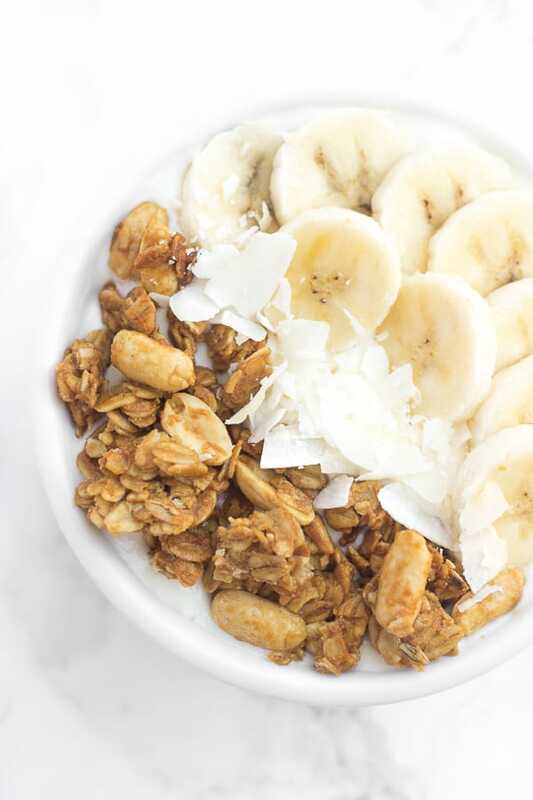 I love peanut butter granola so I will definitely be trying this recipe out! Thanks for sharing. This looks delicious! We love peanut butter at my house (even the dogs) and I think this is the perfect recipe for us to make next week! Yay, hope you love it!! Love homemade granola and the way it makes the whole kitchen smell amazing. And with peanut butter –you can’t go wrong!! Peanut butter is the best so anything extra peanutty gets my vote and granola is a favourite for everyone, right?! I like that you added salted rather than unsalted peanuts because not only am I a peanut but also an extra-salt person ;). Freezing granola?! I never knew that worked. Well, I was surprised the first time I heard a blogger say they stocked nut butters or chia seeds in the fridge, too, so I guess we’re just not as fridge/freezer-competent over here ;). I know raw, unsalted nuts are the healthiest but have you ever tried raw peanuts? Blech. LOVE me some salted peanuts! And yes- I’ll freeze most baked goods like banana bread, muffins, etc. and granola freezes even better than those! Mmmm this sounds amazing girl! Peanut butter granola would have to be my favorite, except I can’t keep it in the house because I will literally eat it by the handful until its gone! Another delicious recipe as usual! Thanks, liv! I will try to make one soon! And let you know. Those clusters!!! And I love that the ingredients are so simple. Defs adding chocolate chips because I can’t help myself. I love peanut butter. I actually like it better than chocolate that is why I got so excited when I saw this recipe. I am so excited to make this. Thank you for sharing. You’ll have to let me know what you think, Sheila!